Poet Paula Meehan reflects on a time of healing in her life when the excitement and mystery of art transcended the daily process of craft. They say it takes ten thousand hours to master a craft. I’m not even sure who the ‘they’ are, giving this advice. Some manifestation of a folk wisdom, a voice of common sense in the head. An experiment: two groups of first year art students are given different criteria for how their pieces are to be graded at the end of a ceramics module. One group is told they will be judged on one exquisite piece of work and are given a long list of aspects of the work that will be examined — its form, for design, its materials’ management, its conceptual intent and so on. The other group is told the grade will be based on how much of their clay allowance they use up. Their entire body of work will be weighed as part of that grade. Both groups are taught the same few practical things and given a basic history of ceramics in their region, some sessions on museum collections, and a look at ceramics in the commercial galleries. Quality for one gang; quantity for the other. The results are not simple. The students who have to produce one Exquisite Masterpiece of Genius are hampered by over analysis; by terror of failure; by the weight of expectation generated by the language used around their learning. The second group, however, and these are students remember, learn a great deal: the practice of the body learning the making, bypassing the interference of the mind; the calming, even trance inducing, effect of the repetition of certain actions, sharpening focus and attention; the reduction of fear around judgement; the growth of trust in the materials; the growth of courage to follow a line of making even if it goes up a cul de sac and the pieces don’t work out. Not that there doesn’t come a time when a critique is desired. There is a time when a critique is salvific and necessary for the soul of the artist. The ten thousand hours though: 1,250 days at 8 hours a day. 250 five day weeks. Not that the apprenticeship ever happens that neatly, in such tidy measures. The false starts, the re-draftings, those cul de sacs, the life itself intervening, derailing the best laid plans. I like to think of the craft as something we get on to go somewhere — spacecraft, aircraft, seacraft, landcraft, fit craft for a journey. To learn the craft is to learn to make something that can take us there, take us to the elsewhere the human soul craves. And so when the sea is rising, the river is in spate and there is only the time to throw together a few planks and old barrels and brave the elements then the best craft is that ramshackle raft. I was a teenager when I first read this and was ambushed by the thought that there might be a difference, a distinction, between craft and art. I was beginning to experience that difference myself as a young maker. I was beginning to see that there were days when I made something that leapt the bounds of competency, that was more than the sum of its parts. Where I said something that I never expected to say, where I wondered just who wrote the poem for it seemed to come from elsewhere, where I was shocked, sometimes even frightened by what I’d written. Where I began to sense that this was the art of poetry as opposed to the craft of poetry. This was the mysterious heart of the matter, the world made new and strange and rich and I was exhilarated by that mystery and by the potential of that energy. And that edge is what I’ve spent my creative life desiring and courting. When a close family member died by her own hand in June of 2001, I went onto a kind of automatic pilot. I got through the days. I wrote poetry, some real, some obligatory, in about the usual proportions. I missed her very much and the legacy was burdensome. I saw in my family and in our friends and neighbours the different coping strategies. I saw the frayed edges where we weren’t coping at all. My world was drained of colour, of inspiration. Some connection had been lost. I felt like a ghost myself. I went on with my life in a willed way — I’ve worked every single June the 13th since her suicide and I’m usually working away from home that day. In my creative life I fell back on the long craft practice to keep making poems. I bless the process for that; for the daily going to the desk and spinning the lines. I’d about the same proportion of blocks and free runs at the work as before. It seemed the craft could outride grief though not assuage it. Sometimes I couldn’t get out of bed and wept all day. Not often. Maybe not often enough. My partner, who is a sailor and has faced levels of fear that I cannot, or want to, even imagine, would give me tea and tell me that crying is the quickest way to shed stress. Scientifically proven. And that would make us smile. Scientifically proven! I went for bereavement counseling and that helped. It was useful to have somewhere to take my grief every week, to say in the flow of work and love “no I’ll park that and take it to the next session of counseling”. It helped me not lay the whole thing on those closest to me. But there’s no doubt that for all the help and kindness I got, for all the salvific power of exercising my craft, the colour had gone out of my world. Then in 2005, some years after the death, my sailor gave me a small box of watercolour paints for my 50th birthday. We were staying above the salt-flats of Strunjan in Slovenia, on that short stretch of coastline between Italy and Croatia. We lived in a converted stable that had once been used to billet mules and horses and their drivers while they picked up their loads of salt to pack all over the Austro-Hungarian Empire. And before them the Romans had harvested salt there; their word for salt remembered in our English word salary, and remembered in the idiomatic Are you worth your salt? They still harvested the salt by the old method and I loved to walk the dykes about the salt-flats. The salt flats were periodically flooded with sea water, the dyke gates were closed and the sea water was then left to evaporate under the fierce summer sun. The salt flakes that were left after evaporation were then swept into conical mounds, bagged and taken away. Then the whole process would start all over again: the dyke gates opened and the Adriatic sea let in to flood the flats again. I loved the rhythm of it. I loved the feeling of being flensed in the hot sun and intense salt air. When I opened my birthday present, that small box of watercolours, something magical happened. I had the exact same rush of excitement I had as a child opening the Christmas box of paints. There was always a box of paints for Christmas right through my childhood. Always asked for. From Santa or an Auntie or Uncle. A bonus if I got two in the same year. Made of tin. Made in Hong Kong. The tin lid pressed to form regular wells to mix the paints in when opened out and laid flat on the table. The intense rectangles of colour, all pristine and unsullied yet by mixing. The crap brush that always came with the box. The sure knowledge that despite the first few days of careful use the colours would muddy up eventually and the most loved colours would be used up the fastest — the blues always first to go. And as I lifted the lid on the sailor’s simple gift for my fiftieth birthday something else opened inside me. The colour flooded back into everything. It was all suddenly promise, my world sufficient mystery and potential; and I knew that whatever happened now the world was all gift. 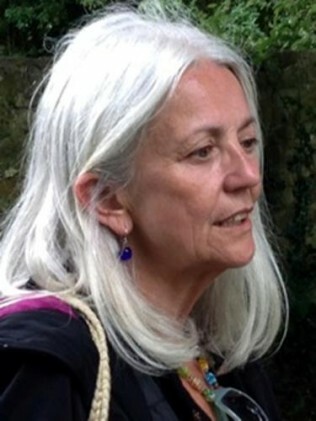 Paula Meehan has just completed her term as Ireland Professor of Poetry 2013-16. Her public lectures from the professorship, Imaginary Bonnets with Real Bees in Them, were launched this year from UCD Press; in November Dedalus Press will publish Geomantic, a new collection of poems. A lovely and timely read for me personally. I was exhilarated by that mystery and by the potential of that energy. And that edge is what I’ve spent my creative life desiring and courting.